After the lingerie set and the embroidered sweatshirt I decided to round the week off with the pencil skirt from The Maker's Atelier Essential Collection. Well I had just bought the sequin fabric from Bambers As the skirt is made in stretch fabric it doesn't restrict movement like a traditional tailored pencil skirt. The patterns in the book are printed both sides so you do need to trace off the pattern pieces you require. At this point I hadn't decided how to put in the lining so I just cut out the same pieces in the lining fabric. As I only had one pattern piece and it was cut in a double layer I did not need to worry about direction but I don't think it would matter with this fabric. An internet search had taken me to Lauren Guthrie's blog on sewing with sequins which also had a video tutorial link with some great advice. With this fabric you can just pin and cut as normal although i did use one of my older pair of scissors. Be prepared for a messy work space! I sewed the sides of the lining first to check the fit. For me it was perfect - snug but not overly tight. For the sequin fabric I started with a regular 14 needle but changed to a denim 16 when it broke. As suggested in the book I used a straight stitch just applying a little tension as I fed the fabric through the machine. Then I had to decide how to attach the lining. I suddenly thought I couldn't simply put wrong sides together and turn over the top edge as then the sequin fabric would be against my skin. So with right sides together I stitched on what would be the fold line for the waist. I turned to the right side and stitched along the edge with a stretch stitch ensuring the lining fabric was not showing. Then I stitched another row the width of the elastic away from the first row leaving a gap to insert the elastic. I threaded the elastic through and used a safety pin to tie the ends together whilst I checked the fit. I did need to shorten the elastic. I then stitched the ends of the elastic together and closed up the gap. The end result is pretty neat. Although I had finger pressed the seams they didn't seem to want to lie flat so I went back and stitched them down. For the lining I used the machine but the sequin fabric I did by hand using a silk thread and a cross over hem stitch. It didn't take long but looked much better. 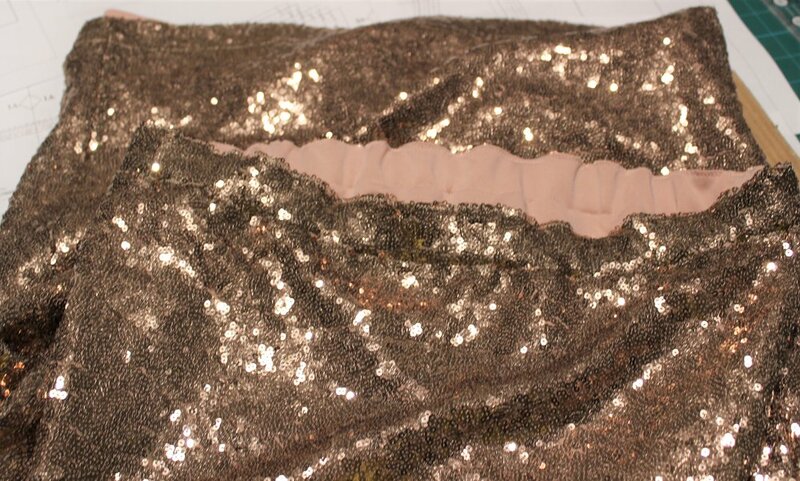 I was going to bag the hem but the sequin fabric had stretched out slightly and was now wider than the lining, so I just machine hemmed both ensuring the lining did not show. I did press the hem with some steam just to flatten and it worked. So now I need to make a top. The suggestion in the book is for tonal matte-finish fabric using the the drape top pattern in the collection. I'll let you know how I get on.